There is nothing more important than keeping the customers delighted and hooked to your organization, but ever wondered how the work can become painless for the sales and your customer service team? They certainly deserve a suitable and efficient way to reach out to customers in the best possible way without being burdened. At times, it becomes backbreaking to live up to the expectations of both the management and the customers, in this scenario, a CRM works phenomenally well to lift the sales team out of the mire and perform better than anticipated. Perhaps it not always as simple as marketing a product well in the market and staying ahead of your competitors in terms of revenues and profitability, it’s also about giving exceptional satisfaction first to your sales team and second, the customers! Selling the services or yourself becomes a less of headache with the right techniques adopted. Aggressive selling is not the main concern but what’s more important is to take interest in them rather than advising them to take interest in your product / service. Quite often, a large chunk of precious time is spent on administration and finishing the bag logs. Stop this, you do not need to do at all, one should, instead, spend that time working on how you and your part of work can get better. After all, it’s better to devote time to some better constructive and productive work. This is possible only when you intend to effectively make use of your CRM Software. Reckless and incautious use of your CRM Software will not give you any in-roads into success and accomplishment. So it definitely implies that the resources in-hand should be utilized to their best efficiency. Many a time’s just entering in the data doesn’t give you any edge. It is therefore, important to regularly fill in the right details and periodically go though it and try to analyze what all the collected data means. Blind working gives no achievements! There is a far more differentiation as here you get to arrive at customer segmentation allowing you to build a rapport with your individual customers instead of directly getting to sell the product. Please nobody likes that, it is easy for one to get the customer directly to buying the product but this way there is certainly no assurance that the customer will stay for long. Long ness isn’t exactly the focus issue but the quality relation with the customer matters the most. After all, you and your business should avail of all the benefits your CRM Software is offering! Yes this isn’t from the context of a school project work. It’s, apparently, imperative that the departments especially who require collaboration from time to time, work together in a cohesive manner. CRM implementation in their systems keeps the people working in different departments always ready about the every detail and the updates regarding work. An up-to-date real-time data at the tip of fingers to all the concerned people keeps them quipped to perform better resulting into better productivity. Have you thought deeper about sales automation? This is the real purpose of any CRM Software. It drastically not just reduces the cumbersome work of your sales team but enhances their effort and brings along with itself new opportunities for better lead generation, satisfactory follow-ups, 360 degree perfection in handling well the opportunities and future prospects, etc. The word ‘automatic’, that is considered to be synonymous with something that simplifies work, isn’t really taken as gospel of truth in India. What we must get through our heads is that it, on a bigger level, revamps the quality of your work you are doing. It as well saves time and effort that can be better utilized for doing other productive work. 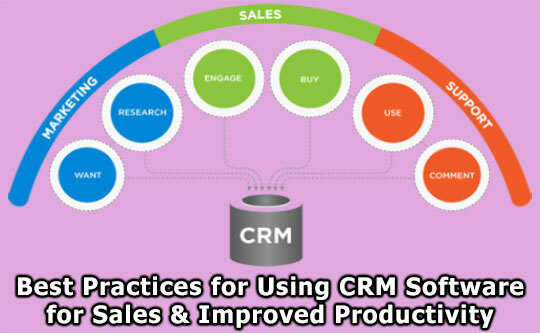 To shorten it, a potent use of CRM Software will yield your business with benefits like reduced sales cycle, reduced customer attrition, increase in sales win rates, enhanced productivity of your sales team, etc. Do not get bored with the social media engagement! Yes, there is no denying the fact that everybody has a different perspective about many different things but it’s still vital to put forth and share your business’s specialties and how does it want to transform the lives of those who want your business solutions. It’s still more important to listen to what people perceive about you and your rivals. This is a fantastic medium to get a step closer to your customers and your non-targeted audience to get to know their mindset and what do they expect from us, the degree of engagement and our willingness to heed to their problems and as well listen to their advices. Many CRM Software come with the built-in features of connecting to social media sites directly and also responding to the updates accordingly. If your customers like being there, then certainly you must also be there to hear as well as get heard. One thing that should be very clear is that highly visual and graphical reports give you a technically sound insight into business and employee performance across multiple criteria, facilitating informed business decisions. Your chances of success transform from unpredictable to actionable decisions to rack up good lead ahead in terms of profitability. It’s time to exploit these business intelligence reports to become well-informed and get better with the productive, profitable and revenues framework. To wrap it up, it is widely believed, your success lies in your hands. Similarly, what you get out of CRM also depends on what use you make of it. Whatever software or company it is, make it a point you are not inadvertently pushing your company into a state of oblivion. Be sure that the right use of anything, removes your qualms about the level of triumph is upcoming or is in store for your company. Improve your business with the good use of CRM Software and scale greater heights with the magnified productivity. This article is written on behalf of Sage Software Solutions, who provide integrated ERP, CRM and payroll software. It helps SME to manage their business and customer. You can find more about them on Twitter and LinkedIn. Can Your CRM Save Your Business? OnSite CRM software gives you total control of your entire sales process and lead pipeline. Making it easy for you increase employee efficiency saving your business time and money. Easily integrate with all your major lead providers. Then increase your speed to contact with our Dialer and Emailer solutions.